Cuzco is big on tourism and thousands of tourists folk to this city each year, making it quite a popular destination in Peru. Having lived here for almost a month I can see the appeal of this city, it was the capital of the great Inca empire and it is very rich in history which you don't have to look far to find. From the many museums to streets that still have the old Inca walls that date hundreds of years back and to the many ruins that are open for exploration, you are basically surrounded by history. While visiting this city you have to at least know about Pachakuteq who is credited for having greatly expanded the Inca empire. The empire covered Cuzco and some surrounding areas but Pachakuteq expanded it to include: north western part of Argentina, north and central Chile, south central Bolivia, Peru, part of Ecuador and southern Colombia. I took a picture of the map below illustrating how vast this empire was. 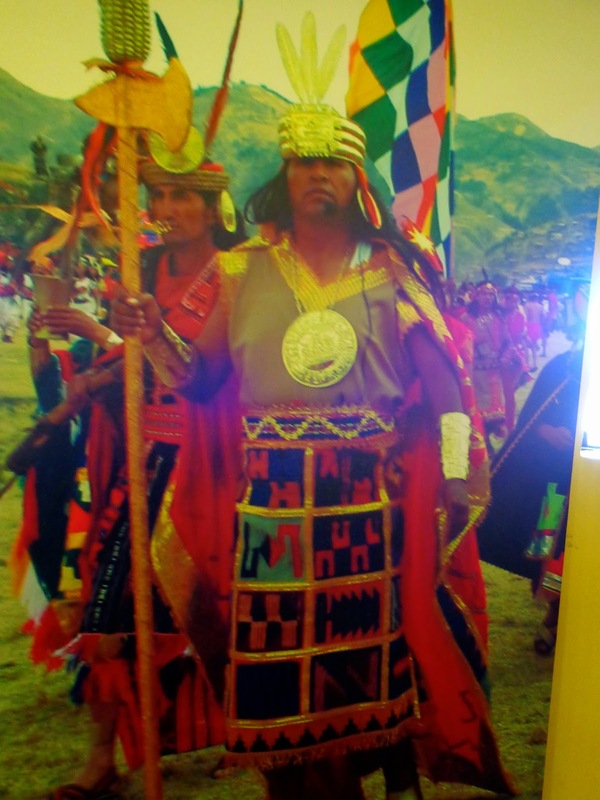 I would recommend visiting the museum of Pachakuteq and the Inca museum which have some interesting historical facts and information about the Incas. The museum of Pachakuteq is not too huge and once inside you have to go up several stairs until you reach the sculpture of Pachakuteq at the very top. Each floor level has historical information so as you go up you learn more information plus you get a pretty awesome view. I took a few pictures at this museum but unfortunately I don't have any from the Inca museum. Some of the weapons of war that were used to conquer. The man with the hat in the picture below was Tupac Amaru, leader of an indigenous uprising against the Spanish in Peru. If museums are not your thing then take a walk along the oldest street in Cuzco, Calle Loreto and Calle Hatunrumiyoc to check out the very impressive Inca walls that have survived hundreds of years and look so perfect that you have to wonder how these people did it. This is an Incan wall, the bottom part with the huge stones. There is no mortar holding the stones together and each stone has been perfectly cut to fit into the next stone; therefore not requiring any mortar for reinforcement. The lines are so perfect when you observe them that you can't help but be amazed by the craftsmanship. The Incas considered these three animals as sacred: The Puma for it's strength, the snake for it's speed and the Condor for it's ability to fly. If you look closely at the picture below do you see a representation of two of the sacred animals on the Inca wall. Notice the puma at the top and the snake at the bottom? This is a wall that was built by the Spanish after conquering the Incas, notice the huge difference? when the Spanish conquered the Incas they destroyed their structures and built over them, actually most if not all the churches that were built by the Spanish back then, were built over destroyed Incan structures as a way to illustrate the Spanish conquest and power. A lot of the Incan structures had trapezoidal doors and windows, this was to provide more stability hence making them resistant to earthquakes. That's it folks, it's really been fascinating learning about all the history that's to be found in this place and it has given me more appreciation of what's around me. I forgot to mention that not too far from where I live in Cuzco there is a cobbled stoned street which as it turns out, when it was being built in the modern times, what used to be part of the great Inca road system that passed through the 6 countries I had mentioned earlier, was uncovered. Can you even begin to imagine how long and well organized this road was? ironically it also ended up being part of their downfall because it opened the empire to invasion from the Spanish and exposure to diseases like small pox which wiped out a great number of the population. PS: If I got any historically facts wrong feel free to correct me. Preservativos in Spanish mean condoms not preservatives (substance used to preserve a product from going bad). Yes, I had an embarrassing incident that resulted in a lot of laughs. Now I know! Pachacuteq had two sons named Tupac and Amaru. I have heard that Cuzco is a very spiritual place and prior to coming here I had been told by a few people that there is such a spiritual vibe about this place. Well, I must have missed out on that spiritual vibe because I don't get it. There are many spiritual retreats here and there are plenty of spiritual ceremonies that are held by shamans. I have not ventured into that territory and I am really not curious, does that explain why I don't get the spiritual vibe. There is a popular ceremony here called Ayahuasca, read about it here or look it up further online. I have spoken to those who have participated in the ceremony and I have heard of how much it has helped them spiritually and mentally but I don't think it's something I would be interested in participating in. To be honest with you it's just not my cup of tea and it actually freaks me out but kudos to those who benefit from it.